1 / 4 → Why Recycle? Any commercial entity producing food waste can now divert it to anaerobic digestion. 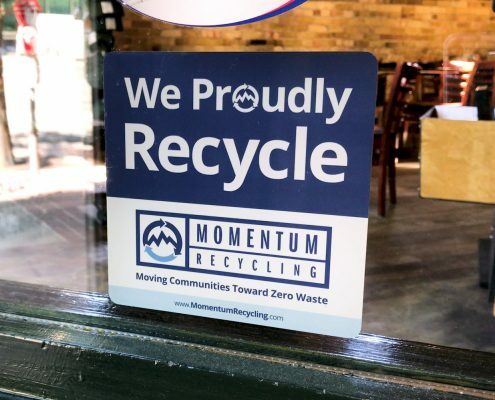 Through Momentum Recycling, your organization can recycle packaged & unpackaged food waste, including prepared food, fruit, vegetables, meat, dairy, and fats, oils & grease (F.O.G.). Other companies have you sign a 3-year contract. If you don’t cancel before it auto-renews, you may be stuck with a service provider who doesn’t fit your needs. We simply ask that you sign a non-binding service agreement which merely requires a 30-day notice before cancelling service (frequently, we are able to halt service & remove your container within 1-week). No “cancellation” or “bin removal” fees either. We Provide the Right-Sized Service for Organizations of All Sizes. 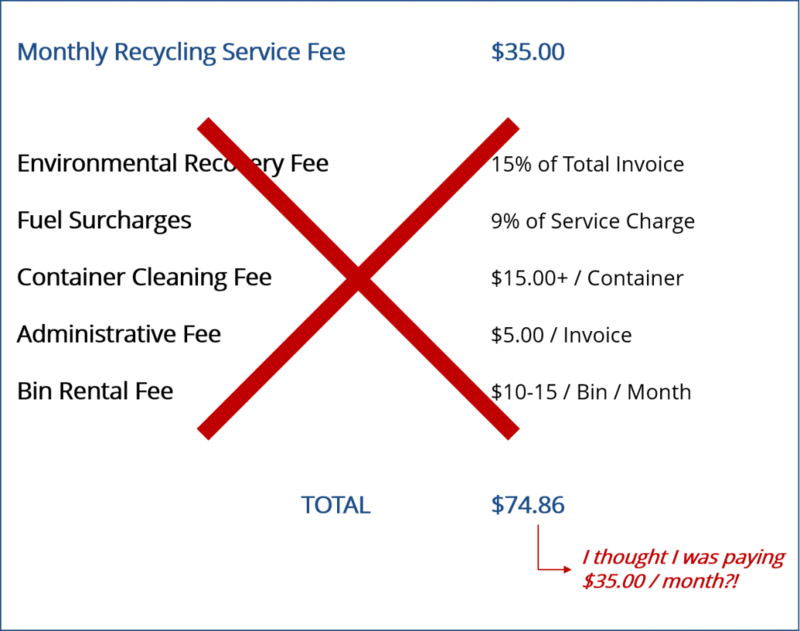 Stop Throwing Money Away on Miscellaneous Fees. We’ve all been there: you sign-up and BAM! – here come all of the fees you were not told about. Nobody likes hidden fees – and neither do we. So when you compare quotes, make sure you are comparing apples-to-apples to avoid surprises later when your bill arrives. Let us do the heavy lifting! We know it’s time-consuming to have to pull your bins through the building and out to the curb every week (or multiple times per week), so let our friendly staff service your entire building without you having to lift a finger. Review Your Progress + Track Your Impact. Track how many pounds of each material your organization diverts from the landfill each month. Our free reporting tool shows you how your collection volumes equate to the elimination of carbon emissions. 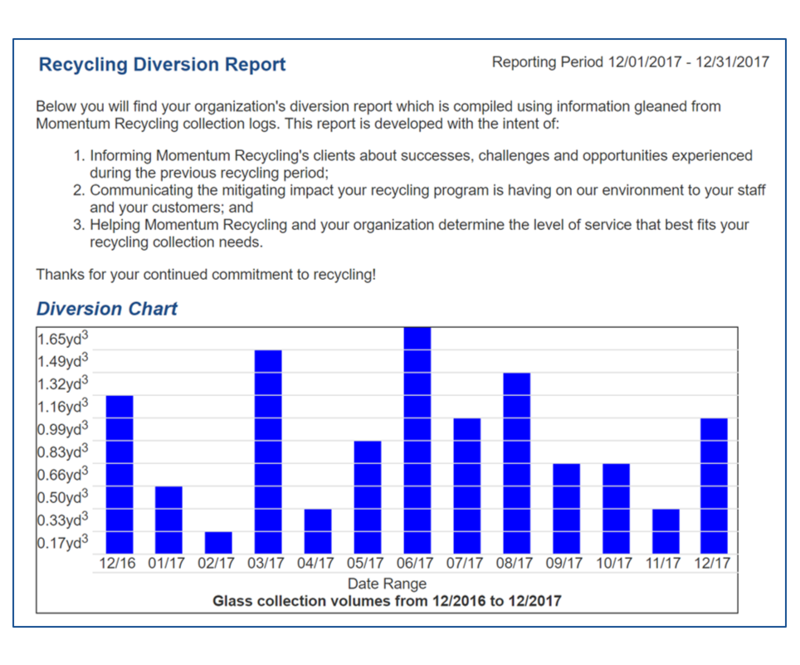 Plus, you can share these reports with members of your organization to set goals & encourage participation, or you can share them with your customers to show them specific metrics regarding your sustainability efforts. 80% of consumers are willing to buy a product from an unknown brand if it has strong social responsibility commitments. We provide you with free marketing materials as well as promote your organization’s commitment to sustainability to encourage residents to support you as a local sustainable business. Show Customers That You’re a Sustainable Business! Our straightforward pricing is simply per-collection. Depending on the volume of green waste you generate, choose the container quantity that best suits your needs. After examining your available space and projected volume, determine how long it will take to fill the bins in order to choose how often you will need service. Note: seasonal or special event pickups available upon request. Reminder Notifications: you can choose to receive either an email, phone call, or text message reminder notification. Services currently available in Salt Lake County and expanding soon to neighboring counties. 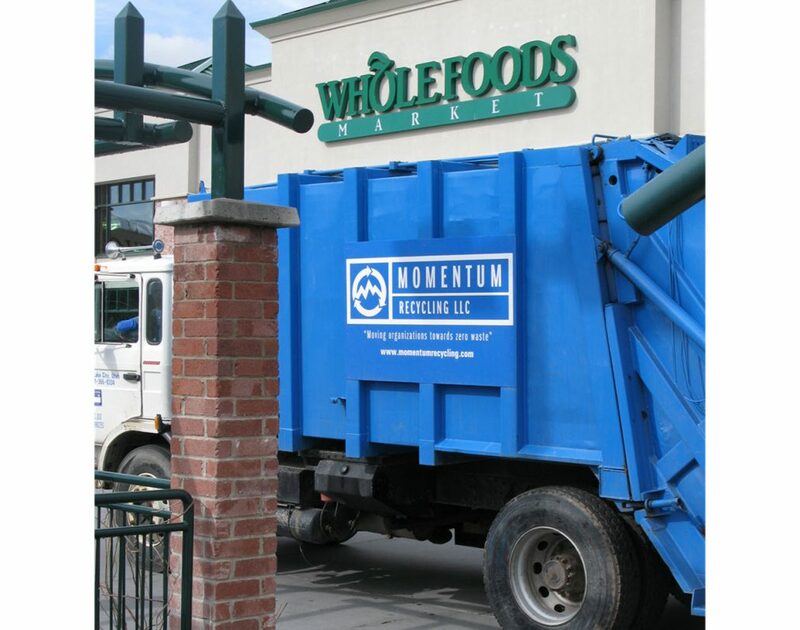 Want Food Waste Recycling at Your Location? Voice your support: in order to expand the service into new areas, we need your support! Please contact us to be notified when the service expands to your area. Choose the bin quantity and pickup frequency that is right for you. Get the Lowest Price: since pricing is based per collection, it is more cost effective for you to have more carts with less frequent pickups. 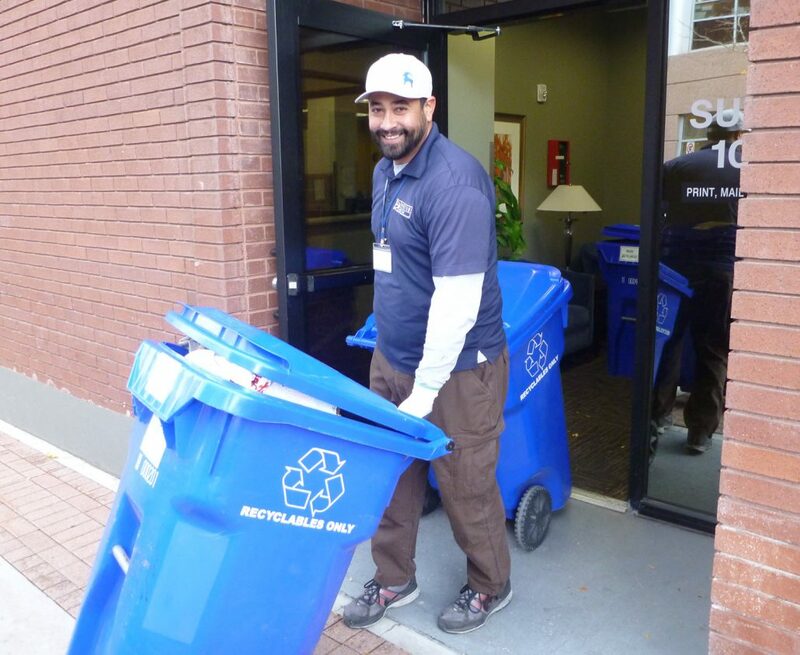 For just $5.50/bin per pickup, you can have our staff enter your building to pull your bins outside and replace them for you. I attest that all information on this form is accurate and that I have read & understand the Terms of Service. I accept the Monthly Total Service. I understand a one-time $35.00 Activation Fee will be added only to my first invoice. Answer: Good question! For one, food waste makes up nearly 30% of our landfills and contributes to climate change when it breaks down in the landfill and is converted to methane gas. Food waste can be composted and turned into a soil conditioner or fertilizer for agriculture. In the next year, we will be diverting food waste to an anaerobic digester where it will be converted into natural gas that can provide power for 40,000 people. Learn more about turning organics into energy. What types of materials are NOT accepted in your green waste bin? Still unsure? – Please contact us for assistance, we’re happy to help! Where does the green waste go? Answer: We currently deliver loads of green waste to the Salt Lake Valley Landfill Compost Facility where it is properly processed into a nutrient-rich compost. Loads from the southern part of the valley are taken to the Trans-Jordan Landfill Composting Facility. Answer: Of course! Just reach out to us and we will adjust your service level right away. There are no fees involved. Does the Diversion Reporting & Monitoring cost extra? Answer: Nope! – we provide these reports to every customer so that they can monitor their progress and share their diversion stats with colleagues and customers. Can you service my location within a set time window? Answer: Our Logistics Team works hard to ensure that we are operating our routes in the most efficient manner and with the fewest emissions possible. We route stops according to their geographical location primarily, but if there are days and times when your containers can’t be made accessible, we will do our best to accommodate your needs – no problem. Do you offer internal service? Answer: Yes! – If it is more convenient for your daily operations to have us come inside and pull the bins out to be serviced, we do offer internal service for just $5.50/bin per pickup. How do I pay for services? When am I invoiced? We are recycling newbies... Can you help us craft our recycling program? Answer: Yes! – We provide free recycling systems process & design consulting services to our customers. Opening a new location? Looking to add a new service? – we’re here to help!